With summer around the corner and many people already packing their suitcases for some much needed time off, pool operators around the country need to keep a close eye on vacationers. A recent incident in Myrtle Beach saw a 12-year-old boy get sucked into a pool drain while trying to retrieve a pair of goggles he dropped swimming in a lazy river. The culprit of the near-tragedy – after an hour and a half, the boy was finally pulled free and taken to a hospital where he was placed in an induced coma, and lived – was a set of loose screws that allowed him to pry off the grate covering the drain, which resulted in the pumping system suction trapping his leg up to the knee. But when a person’s life is at risk, the costs can be high. Wright points to one case where a child was caught in a pool drain and suffered injuries that resulted in a $25 million settlement. “It is a huge liability for resort operations or any clubs or fitness centers that have a pool,” she said. The regulations for swimming holes in hotels, spas, country clubs, and gyms are stringent today after the Virginia Graeme Baker Pool and Spa Safety Act was enacted in 2008. “The premise of the law is that all pools and spas need to meet federal standards for those drain covers – the one that the boy was able to pry off – and also their automatic pump shut-off systems,” explained Wright. 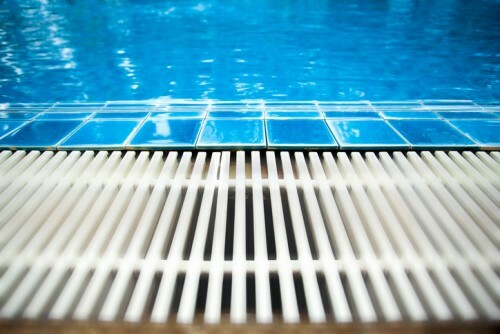 Pool operators have to check drain covers, meet specific federal requirements, and replace them every five to seven years. Something as simple as a sweep of the grates in the lazy river could’ve prevented the incident in Myrtle Beach. The American Hotel and Lodging Association also recommends hotels install safety vacuum release systems that would automatically shut off the pump for a hot tub or pool if someone gets trapped in the suction. When Venture Programs underwrites policies for any kind of pool operator, you can bet its team is checking that regulations are being met. Besides insurance, any facility that has a pool needs to ensure that its staff are trained and the emergency shut-off valve is easy to find because in a high-pressure situation – like when a child is trapped underwater – it’s important to act quickly. “It’s just a common sense thing that their staff can be trained to look for and if they do see people around these areas, make sure they’re moved, put signage up, make sure that there’s a phone nearby and that when someone does get trapped, they know how to release them,” explained Wright.